An arduous journey like Ladakh can take its toll, on not only the driver and passengers, but also on the car. In places like Manali – Leh highway or Zanskar Valley, a mechanical failure can spell disaster. With nearest town miles away and a mechanic even further down the road, it is a good idea to get your car serviced properly and get the worn out parts replaced, before embarking upon a journey of this magnitude. Clutch Plates: For the steep and hilly terrain of Ladakh, it is best to ensure that your car’s clutch plates have enough life left in them to see you through the trip comfortably. When you’re getting your car serviced, ask the mechanic to check the clutch plates and replace them if necessary. Engine oil and engine oil filter: It is essential to get your car’s engine oil and oil filter changed before going to Ladakh; this will help you extract optimal performance from your car engine. Brake pads, shoes and oil: Get the brake pads and shoes checked and if there is little life left in them, get them changed, since driving in hilly terrain continuously causes more wear than driving in plains. Also get the brake oil level checked and if needed, get brake oil bleeding done as well, in order to get optimal brake performance in Ladakh. Coolant: Continuous driving at high rpm takes its toll on the engine and causes it to overheat, even in cold climates. So make sure to get the car coolant changed/topped up at the time of service. Air and fuel filter: Get both of these filters changed, since Ladakh has quite a dusty environment and it doesn’t takes long for an old air filter to clog up. Poor fuel quality can also clog your cars fuel filter, so get them changed if they are nearing the end of their life. Also get the air filter cleaned, after arriving in Leh. Electricals and battery: Ensure all the electrical connections are working properly and battery is in good condition. Don’t forget to top up battery water and change any bulbs/fuses which are showing signs of age. General servicing: Ensure all the nuts and bolts are fastened properly; also check fan belts, timing etc. Tyre alignment: Get tyre alignment done, if needed, because you will need your car to be handling at its level best. Tyres: Check the condition of the tyres, including that of the stepney. If tyres are nearing end of their life or have serious cuts/cracks in them, get them replaced ASAP! Anti-rust treatment: Most service centers offer anti rust treatment for the underbelly of the car before the beginning of monsoon season. You might wish to get it done before your Ladakh trip, since you will be driving through water crossings and snow and these can cause your car’s underbelly to catch rust. If you have gone through the above routine, your car should hold through for the entire trip. However it would be a good idea to ask your mechanic to teach you minor chores like fixing punctures, changing bulbs and fuses, checking and topping up essential fluids such as battery water, coolant, engine oil etc. 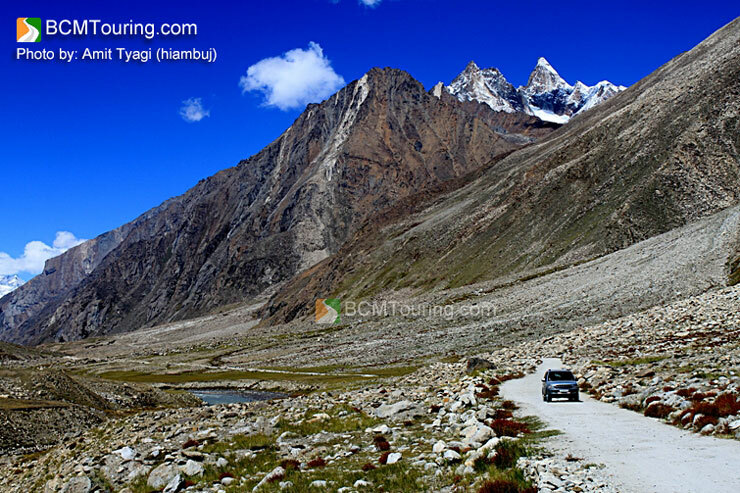 Now that you have prepared your car and are ready to embark upon your trip to Ladakh, here are few checks that you need to perform on a daily basis. Check if all lights, horn and indicators are working. Double check fluid levels such as engine oil, brake oil, coolant, battery water etc. Check tyres for air pressure as well as look for any signs of puncture or damage to the side walls. Check for any leakages or loose nuts and bolts. Start the engine and let it idle, then check if there is any unusual sound coming from the engine. Although it is recommended to learn basic repair of your car, even if you don’t know much, it is generally a good idea to carry necessary tools and spares. Sometime even in the smallest of town you can find a mechanic or someone who knows how to do basic repair, but might not have the required tool and spares to go through it. 1. Tool kit: OEM tool kit that came along with your car is an essential part of the tool kit that every road trip enthusiast must carry. 2. Screw Driver set: Try to carry a screwdriver set which has multiple attachments; a set which also includes a set of Allen keys is a good choice. While purchasing screwdriver set, ensure you get one which is the sturdiest of the lot and won’t break while you are tightening or opening something. 3. Steel wire: Can be used to tie together various parts in case of any breakage. 4. Electrical & Scotch tape: Can be used for tying together various parts and insulating damaged wires. 5. Torch light: In case of break down in the evening or early in the morning you will need it to see your car’s engine, even once you are out of your car, it can prove quite useful. 6. Foot or Electric air pump: Even though you have a spare tyre it is a good idea to carry an electric pump, since it can be used not only for fixing punctures it can also be used for adjusting tyre pressure. 8. Puncture repair kit: Puncture repair kit for tyres with tubes should consist of; rubber patches, solution for pasting the patches on tube and tyre iron for taking off the tyre from the rim. In case of tubeless tyres, purchase a tubeless puncture repair kit. It is also recommended to carry a spare tyre valve. 9. Jump start cable: In case you car’s battery dies, you can use the jumpstart cable to start your car with the help of another car. 10. Spare can for petrol/diesel: In case you run out of petrol/diesel at some point, you will need a spare can in which you can bring enough petrol/diesel to reach the nearest town. 11. Petrol pipe: In case you run out of petrol/diesel in the middle of nowhere and a kind soul agrees to lend you spare petrol/diesel, you will need a petrol pipe, through which you can get the petrol out of the tank. 12. Plastic sheet: Can be used for keeping tools or to stop air/water from coming in, in case one of the windows breaks. 13. Fire extinguisher: Can come in handy, carry it! 1. Engine oil: Carry at least half a liter of engine oil recommended by your car manufacturer, daily check engine oil level and top up if necessary. 2. Headlight and brake light bulb: Always carry a headlight and brake light bulb. 3. Coolant: Can come in handy in case your car is overheating. 4. Battery Water: Carry a liter of battery water, frequent starts and continuously running headlight and music system can put quite a load on the battery causing the water to evaporate faster. 5. Spare fuse: Ask your mechanic about the essential fuses that are needed for the car and carry them with you. 6. WD40: Can be used to lubricate and clean various mechanical and electrical parts of your car. 7. Rope for towing the car: In case of a serious break down you will need it to tow your car to the mechanics shop. 8. Electrical wire: Can be used to replace faulty electrical wire in the wiring. 9. Few nuts and bolts of various sizes: Based on your cars requirement, carry nuts and bolts of various sizes for things like the bumpers, doors etc., generally your service center mechanic would be able to advise you on this. 10. Small wooden plank: In case your car gets stuck in mud and starts loosing traction, you will need to put couple of small wooden planks underneath the stuck tyre to ensure it gets adequate grip. 11. Spare car key: Carry the spare car key in something that you will always carry with you when you get out of your car, after all it is not unusual to leave the key inside of car by mistake and get locked out. 12. M-Seal: M-Seal can help you fix small cracks or holes in your car’s fuel tank or oil chamber, which can get damaged due to underbelly getting hit while traversing through rough sections. Carry two – three copies of the above mentioned documents; generally you should have photocopies of Registration certificate and Insurance certificate handy, while the original should be kept in safe yet accessible place. In case of photocopies, they would have to be attested by a gazetted officer in order to hold any value. You should always have your original license and PUC certificate handy as well. In case you any queries about what has been written in this article, please post them here. It is not difficult, just reach manali and ask for the DC’s office. Just need to fill up a few details and you can get the permit. Just keep in mind 2 things, either monday or tuesday of every week rohtang pass is closed for public for maintenance, so keep that in mind, and for all permissions keep a day spare in manali. Also try and make your reservations for sarchu, before hand from manali itself. How was the trip, any advice to share, i am planning to go this month. Unless that friend is traveling with you, you will have to hire taxi to visit Nubra Valley and Pangong Tso.